Steve Berry is an internationally known bestselling author of thrillers that leave his readers on the edge of their seats. He combines history into his novels, grounding them in reality to make his stories very believable; his style has earned him legions of fans. His latest novel featuring Cotton Malone, the hero of many of Berry's books, is The Jefferson Key . In it, Berry takes the reader from the early years of America's history to the present day, and Cotton Malone and his love interest, Cassiopeia Vitt, investigate how the deaths of America's four assassinated presidents are all directly related, linked to an obscure clause in the Constitution. Interviewer Douglas R. Cobb: Before I get into asking you questions about The Jefferson Key , I'd like to ask you a few questions about one of your other major interests: history. Besides being an international bestselling writer, you are a philanthropist. Can you tell us how you came up with the idea for your new philanthropic foundation History Matters? Steve Berry: Elizabeth and I kept noticing the serious lack of funds available for historic preservation, so we decided to do something constructive to help. History Matters helps communities raise funds for historic preservation in an innovative way. We do it through a writer's workshop, which the participants buy their way into with a contribution. It's an intense 5 hour experience on the craft of writing. So far, we've hosted 9 History Matters events and raised nearly $65,000, teaching over 600 students. Folks interested can find out more at steveberry.org. You creatively combine your love of history with your passion for writing in this foundation. Would you advise other successful artists to combine their passions to create their own unique way of giving back? I say all the time that writing what you know is bad advice. Instead, write what you love. If what you know and what you love are the same thing, great. For me, that wasn't the case. I was a lawyer by trade, but I loved history, secrets, conspiracies, international settings, action, adventure. So that's what I wrote. What types of projects does History Matters raise funds for, and what has the foundation been able to achieve? We've helped out buildings, documents, artifacts, libraries, you name it. History can be found in a variety of places and in many sources. We like to help them all. You take us back to the times of George Washington, our first president, and Andrew Jackson in The Jefferson Key . How does Washington figure into your story, and why does Jackson's prosecution of two pirates lead to an attempt on his life by a group called the Commonwealth? Washington was aware what the privateers did for the Revolution and publicly acknowledged their contribution. In my story, he grants letters of marque to my pirates, per the the Constitution, Article 1, Section 8. It's those letter of marque that provide the spine of the story. I came across the refusal of Andrew Jackson to pardon a couple of convicted pirates in the research. Once I read about that it had to be included. Way too much of a coincidence to ignore. Why can't Cotton Malone get in touch with his boss, Stephanie Nelle, head of the Magellan Billet, at the start of The Jefferson Key ? She's in deep trouble. Cotton just doesn't know it, but he soon will. Quentin Hale is one of four captains of the Commonwealth. What does one of his accountants do that causes Quentin to have him placed into a gibbet and drowned at sea? He violates the Articles that all pirates signed between themselves, my fictional ones included. These governed their daily lives and were adhered to religiously. Contrary to Hollywood's stereotype, pirates worked out of order, not chaos. Clifford Knox is the quartermaster of the Commonwealth. What are the duties of the quartermaster, and how is he involved in the assassination plot against President Danny Daniels? The quartermaster was the man who administered the pirate ship on an everyday basis. He was like sergeants in the army and chiefs in the navy. He was the second most powerful person on the ship, elected by the crew. Why and how is Cotton Malone lured away from Hojbro Plads in Copenhagen, where his bookstore is, to come to New York City? What does he do to foil the assassination? Loyalty to his former boss drives him to New York. That concept means something to Cotton. And yes, he foils the assassination attempt, and so starts a world of trouble. Why did you choose to focus on privateers and their role in the history of the United States in The Jefferson Key ? Did the Commonwealth really exist, or did you create them for your novel? Privateers and pirates are both fascinating. Who doesn't like pirates? Commonwealths actually existed when ships joined together for a common purpose. They would draw joint Articles that governed how the mission would proceed and how the spoils would be divided. Using them in The Jefferson Key was a way for the reader to come to know how pirates and privateers really existed. You describe Hale's residence in Bath, North Carolina, very realistically, as you do the St. Regis Hotel and the Grand Hyatt in New York City. Have you visited Bath before, and stayed at the two hotels? Visited all the places, stayed in all of the hotels. Research can be tough. Who is Scott Parrott, and why does Clifford Knox kill him with a lethal toxin? How did you learn about the toxin, and was it really used as frequently as you suggest? The toxin is made-up, just something I concocted. Scott Parrott is named for a friend from high school. He always wanted to be a character in a book, so I made him one. What made Pamlico Sound, North Carolina, such an attractive area for pirates like Blackbeard to operate out of? Those waters were some of the most treacherous in the world. If you didn't know what you were doing, trouble was all you'd find. Of course, the pirates knew their way around so that spot offered an excellent base for their operations. Also, the local political establishment was quite friendly to them, which made things even easier. Jonathan Wyatt meets his "adversary" Andrea Carbonell, head of the NIA, in front of the Strand bookstore - ironic given Wyatt's view of novels, "Why waste time on lies?" He meets her there because of Andrea's love of books, but still... Is the Strand one of your favorite bookstores in New York City? Have you been to any signings there (of your own novels or those of other authors)? I love the Strand. I've been there many times, so I wanted to include it. Wyatt's hatred of books is part of his character, which contrasts with Malone's, since he's a true bibliophile. I've never done a signing at the Strand, but I'd love to if they'd ask. Why did colonial merchants and governors greet pirates "with open arms"? Pirates provided them with imported goods at an affordable price, which English laws forbid. These governors had to run their colonies and pirates helped make that possible, far more than some distant official in London. In return for their assistance, most colonial governors left the pirates alone. Was Robert Patterson a real historical figure? How did Jackson get to know his son? He was a friend of Jefferson's, a mathematician. He shared Jefferson's love of codes and provided one that Jefferson never could break. He called it the perfect cipher and it remained unbroken until 2009. His son did indeed work for Andrew Jackson. Is there in fact a Garver Institute in Maryland? I made it up and named it after a wonderful lady who works for me and keeps the train at Steve Berry Enterprises on the tracks. Just a few more questions. What is the "one lasting lesson Hale never forgot"? Is it true that Junius Brutus Booth, John Wilkes Booth's father, "threatened to cut the president's throat while he was sleeping," or to have him "burned at the stake"? Absolutely true. The letter he wrote can be easily found online. Quentin Hale and the Commonwealth have to be some of the most dangerous foes Cotton Malone has faced to date. The conclusion of the novel is thrilling, which is packed with action from the start to the finish. How does Hale get his hands on Malone and Vitt, and what does he do to them? They all end up on his massive schooner, heading out to the open Atlantic. I wanted this ending to have a swashbuckling feel, and I wanted it at sea. I re-wrote those scenes several times and I like the finished version a lot. Have you started the next novel featuring Cotton Malone yet? Do you have any ideas about what the next Malone book will be about, yet, or have ideas for a title? Cotton's taking a vacation in 2012. I'm writing a stand-alone with a new set of characters, with new motivations, but the same kind of thing --- action, history, secrets, conspiracies, and international settings. This one deals with something I've never seen done in fiction before. It's really cool. If folks like this new character, he might come back one day. Cotton returns in 2013 with a great adventure involving his son, Gary. Steve Berry is the New York Times bestselling author of The Emperor’s Tomb, The Paris Vendetta, The Charlemagne Pursuit, The Venetian Betrayal, The Alexandria Link, The Templar Legacy, The Third Secret, The Romanov Prophecy, The Amber Room, and the short story “The Balkan Escape.” His books have been translated into forty languages and sold in fifty-one countries. He lives in the historic city of St. Augustine, Florida, and is working on his next novel. He and his wife, Elizabeth, have founded History Matters, a nonprofit organization dedicated to preserving our heritage. 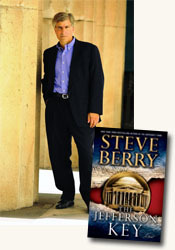 To learn more about Steve Berry and the foundation, visit www.steveberry.org. Contributor Douglas R. Cobb interviewed author Steve Berry, author of The Jefferson Key (see accompanying review), about his book for curledup.com. Douglas R. Cobb/2011.